A reason enough to offer our members the opportunity to discover or to re-discover this remarkable event; that’s why we reserved 35 first class seats on the main stand for the show of Wednesday 26 June. The origin of the Ommegang goes back to the 14th century. Initially it was a procession in honour of Our Lady of the Sablon (OLV van de Zavel) organised by the Grand Confraternity (“Serment”) of Crossbowmen. Quite soon the different guilds and bodies constituting the city joined the procession, which developed into a primarily secular municipal event. The Pageant taking place in 1549 was certainly one of the most splendid. That year Emperor Charles V (Charles Quint – Keizer Karel) visited Brussels, capital of the Low Countries, then part of his huge empire, and officially introduced his son and successor the future Philip II . 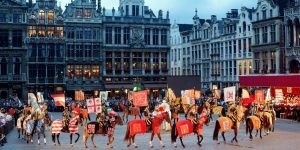 Preceding the performance, which starts at 21.00 h, we will have a convivial and tasty dinner at «Chez Leon», a well known restaurant near the Grand Place. If you would like to join us for the Ommegang you are, for organisational reasons, kindly invited to book early i.e. by transfering a deposit of 30 euros to our bank account (National Trust Belgium IBAN : BE17 0016 2443 2021) by Sunday March 31st at the latest. Due to the high demand for tickets it is most unlikely that additionnal seats can be obtained after this deadline. The Grand Place and restaurant Leon are within walking distance from the Central train Station and the metro stops Central Station and De Brouckère.